New research conducted by the Australian Council for Educational Research (ACER) sought to better understand the impact of the IB Middle Years Programme (MYP) on Diploma Programme (DP) outcomes for students studying in China, Hong Kong, India, Indonesia, and Japan. ACER compared DP outcomes among students who completed their middle years education with the MYP, another international programme, or a state or national curriculum. The findings suggest that students who completed the MYP scored higher than non-MYP participants within specific DP subjects, including Theory of Knowledge (TOK), as well as in total diploma points. ACER used both qualitative and quantitative data to assess the differences between MYP and non-MYP students. The researchers collected DP subject scores, diploma scores, and grades for TOK and the Extended Essay. To compare the two groups’ performances, t-test and effect size results were reported. The MYP group had a higher average diploma score compared to the non-MYP group, and these results were significant with a moderate effect size of 0.39. Looking at specific subject areas, the MYP cohort scored significantly higher in the areas of language and literature, language acquisition, individuals and societies, and mathematics. The difference between the two cohorts was not significant for the arts and science. Additionally, MYP students received a higher relative proportion of A and B grades and a lower proportion of C, D or E grades, compared to non-MYP students, and these differences were found to be statistically significant. These results suggest that the type of education received during students’ middle years influences their performance in the IB Diploma Programme. ACER also surveyed students, interviewed teachers, and held focus groups for a qualitative approach to enrich the data collected. From the student perspective, MYP students reported more frequent use of higher-order thinking skills and literacy and writing skills. Additionally, while MYP students reported group work and collaboration to be important skills gained during the middle years education, non-MYP students reported that their ability to summarize content and memorize information were useful for preparing for DP exams. 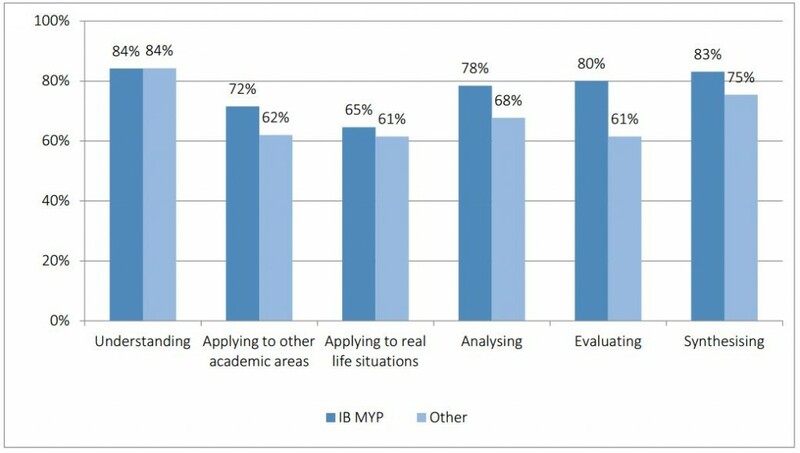 Both MYP and non-MYP students indicated the need for a better transition period from the middle years into the DP, including increased clarity of DP expectations and a greater opportunity to develop analytical skills and exam-taking techniques. Teachers from two schools in Indonesia and India reported that MYP students exhibited greater analytical and writing skills associated with the inquiry-based MYP curriculum. However, there was consensus that MYP student did not always enter the DP programme with the necessary content knowledge. One potential reason for these differences is the MYP’s emphasis on a holistic, interdisciplinary learning experience, whereas non-MYP students likely spent these years focusing more closely on academic subjects. Overall, this study indicates that MYP students perform better than those students who completed their middle years studies through a different programme. Both students and teachers also reported differences between MYP students and non-MYP students upon entering the DP. MYP students were reported to have greater analytical skills, while non-MYP students had more in-depth content knowledge and exam skills. To improve the transition from MYP to DP, students and teachers suggested providing more exam-taking practice, consistent grading between MYP and DP, and increased clarity regarding DP expectations.